The basic midsize sedan market represents a highly competitive and immensely popular segment in America. Consumer demands have helped these vehicles evolve toward higher levels of adaptability and practicality. Some sedans in this segment have become practical, utilitarian appliances that appeal to a consumer's pragmatic senses without stroking one's passion for driving. It is this very realization which has driven the design of the 2005 Mitsubishi Galant, which combines the functionality and practicality, with the enhanced style, safety and performance that help sets it apart it from the class competitors. Designed to yield substantial improvement in interior packaging, overall refinement, and engine output, the bigger, better 2005 Galant offers a practical, yet stylish alternative to the pedestrian, appliance sedans that populate the segment and is designed to attract family sedan consumers with family-sized needs. "The 2005 Mitsubishi Galant represents an exceptional value in the mid-sized sedan segment by offering consumers a stylish alternative at an unbeatable price without sacrificing quality, comfort and ride,'' said Finbarr O'Neill, president and chief executive officer of Mitsubishi Motors North America, Inc. (MMNA). "Utility and style go hand in hand with this latest version of Galant - the ninth generation and our fifth in North America. And the vehicle gives us a clear edge with buyers looking for something more distinctive in the class - a car that offers equal parts performance and excitement." 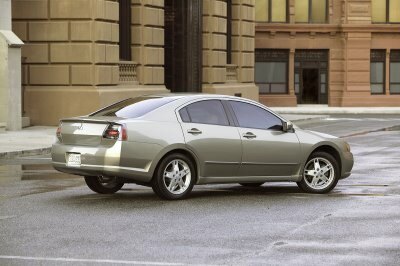 A vehicle's fundamental quality comes from its chassis, and the 2005 Galant is carved from a solid foundation. From the floorpan to the roof, the Galant has a stronger and more rigid platform than any previous generation. Every opening in the body, including doors, trunk and engine compartment, is reinforced to help resist the bending and twisting forces that are exerted on a moving automobile. The body employs higher tensile strength steel panels to reduce body weight and increase body rigidity. The Galant's robust structure is key to its crash safety ratings, ride quality, handling feel and overall refinement. This five-passenger, four-door sedan is powered by a choice of two robust engines designed to produce the majority of torque at lower revolutions. All Galants are equipped with a four-speed automatic transmission, and the V-6 equipped LS and GTS trim lines also benefit from a Sportronic(TM) mode that allows drivers to manually engage their desired gear. Along with offering a comfortable ride, a successful midsize sedan needs to be able to offer seating and cargo capacity for every day needs. To facilitate passenger entry and exit, the Galant's height is 57.9 inches (58.1 inches for GTS). Thanks to its stretched wheelbase, rear legroom is a generous 37 inches and provides comfort during the drive as well as more room to maneuver when entering or exiting. The Galant leads its class in rear shoulder room, providing 57.1 inches of shoulder space for rear passengers. The driver and passenger view the road from an elevated position on comfortable front seats that are among the widest in the class. Passenger comfort is enhanced by a thoughtfully designed and well-tuned chassis, which combined with efficient fuel economy, makes the Galant an ideal vehicle for long drives. An intelligently designed rear suspension utilizes a low-mounted multi-link configuration which not only creates an excellent ride and stable handling, but also helps reduce road noise and improves quietness by adopting a resilient cross member. The easy-to-operate trunk lid-complete with an interior handle-swings up to offer a large cargo area, and the trunk hinges are designed not to intrude on the available cargo space. And to minimize hassle, the trunk features a wide opening and the low lift-over. The Galant's exterior design makes a bold visual statement about the product and the person who owns it, distinguishing itself from the traditional, ultra-conservative styling of most four-door sedans. The Galant's athletic fender arches, European-inspired front fascia treatment, and long, arching C-pillar help the Galant break from the three-box school of sedan design. The Galant's purposeful front and rear bumpers help communicate an image of strength and safety. The vehicle's strong visual silhouette is wedge-shaped, highlighted by a waistline that rises toward the decklid. Viewed from the front, the larger fenders help accommodate the wide 61.8-inch track and reinforce the Galant's bold hunkered-down stance. Large lower air intakes in the front fascia also help convey an image of aggressiveness and purpose. Galant's sleek exterior results in a low .31 coefficient of drag. The Galant offers attractive exterior paint finishes with highlights that add depth and appeal to the sheetmetal. 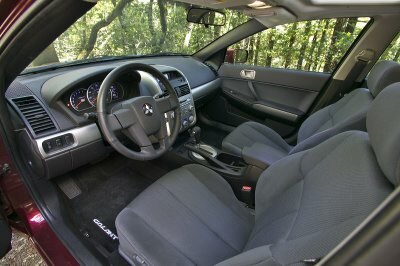 The Galant's interior exemplifies the Mitsubishi brand's spirited product virtues by offering a stylish, upscale atmosphere. The Galant's dashboard is dominated by sculpted, modern, architectural form housing user-friendly, intuitive controls for both the driver and the front passenger. The center dash features a prominent climate and audio control stack that was designed to resemble a modern, high-tech home audio interface with large control knobs. Atop this center panel is an available 4.9-inch color LCD display that provides climate and directional information, and even functions as a interface that can allow owners to customize many of the vehicle's interior functions. At night, the gauges, interior control knobs, and switches are illuminated with striking ice-blue LED lamps that help create a sophisticated interior ambience. Storage capacity was an interior design priority on the Galant, as evidenced by a large-capacity glove box and the numerous secondary cubbies and storage compartments. The intelligently designed center console includes a pair of large-volume cup holders, while other cubby spaces are capable of holding cell phones and sunglasses. The Galant's door panels are covered in modern, padded and textured materials that match the seat covering and instrument panel. The front door panels include large door pockets ideally sized for large map books or magazines, and the rear door panels feature a cubby space large enough to hold Game Boys, juice boxes or other travel items. The Galant's plush seats offer generous shoulder and hip room for superior comfort. The seats, depending on the trim level, are covered in either cloth, premium fabric or leather and they feature deep accent lines to help emphasize the seat width. Leather seat coverings, standard equipment on Galant GTS, are available as part of an option package on the Galant ES and LS. In the interest of reducing fatigue and increasing comfort during drives, the Galant is equipped with ideally positioned door panel armrests, a center console armrest pad and a rear folding armrest complete with cup holders. The Galant's driver's seat includes a seatback pocket, handy for storing magazines or coloring books, and is available with a lumbar support adjuster that is standard on the Galant LS. The Galant is powered by one of two engines. A responsive 2.4-liter inline four-cylinder engine, standard on the DE and ES trim lines, develops 160 horsepower and 157 pound-feet of torque, thanks to Mitsubishi Innovative Valve timing and lift Electronic Control (MIVEC) system. Through this system, which makes use of different sized cam lobes to increase lift for continuous power, even the entry level Galant achieves a high level of performance. But for anyone who equates high power with luxury, the LS and GTS trim lines offer just that. Both offer a standard 3.8-liter, 60-degree, SOHC V6 engine that is ideally suited to provide brisk acceleration for spirited driving while maintaining efficient fuel economy. Rated at 230 horsepower at 5250 rpm, with peak torque of 250 pound-feet at 4000 rpm, the Galant's V6 provides plenty of power and tremendous torque from a wide part of its rev range. The engine's intake and exhaust events are tuned to achieve maximum torque early in the rev range where the engine will spend the most time. The Galant's 3.8-liter V6 engine is mated to a sophisticated four-speed automatic transmission with Sportronic(TM) shifting. The transmission features fully adaptive shift control that "learns" driver inputs and tailors transmission operation to their habits. Both engines are mated to transmissions equipped with final drive ratios optimized to improve the vehicles off-the-line acceleration. And the gear ratios are also well-suited for highway performance. The Galant's four-wheel independent suspension was designed to provide superior stability, excellent ride quality and nimble handling. The Galant utilizes a proven MacPherson strut design front suspension. A large, rigid cross member minimizes the torsional flexing forces of the front sub-frame, improving suspension performance while also reducing noise, vibration and harshness. The Galant's rear suspension utilizes a low-mounted, multi-link configuration with trailing arms. Stiff hydro-formed cross members also help reduce road noise and improve suspension performance by reinforcing the rear suspension mounting points to reduce flex. The Galant's wide, 61.8-inch (1570 mm) front and rear track endow this broad vehicle with superior stability and control. And in the interest of handling, ride quality and style, the Galant is equipped with either attractive 16-inch wheels with 215/60R16 tires or five-spoke, cast aluminum 17-inch wheels wrapped in wide 215/55R17 rubber. The Galant utilizes a proven power rack-and-pinion steering system that is designed to provide the direct feeling and response of a sports car, while the system's effort multiplication provides the low-speed steering control that makes parking and low-speed maneuvering so easy. The Galant's unibody structure features extensive reinforcement to help provide additional passenger protection in the event of a collision. Robust front subframe members are connected with a dash panel crossmember and strong, front steel crossmember to help create a rigid boxed section front subframe area. Reinforced side sill members also help disperse energy in the event of a collision. High-strength steel crossmembers across the floor absorb side impact energy and help protect occupants. In the interest of front passenger safety, the Galant is equipped with advanced front airbags with occupant sensors. For 2005, the Galant offers standard front seat-mounted side impact airbags designed to help protect the occupant's head in the event of a collision. Pretensioning seat belts with force limiters are standard equipment on all Galants. Extensive use of energy absorbing materials appear on the interior and headliner and are used to cover the inside of the front center and C-pillars to help reduce the possibility of injury during a collision. All Galants utilize four-wheel disc brakes. The front ventilated discs measure 10.9 inches (upgraded to 11.6 inches on the LS and GTS). Rear brakes are 10.3-inch solid discs. Coupled with available ABS (standard on both LS and GTS) and EBD systems, the Galant's powerful brakes provide excellent control during panic stops and on rain-soaked roads. Galants are built at Mitsubishi's manufacturing plant in Normal, Illinois, one of the most complex automotive factories on the planet. Based on an all-new platform and designed by Americans to meet the needs of the North American market, the Galant's mechanical design employs cutting-edge engineering and manufacturing technologies that result in a superior vehicle. Above all, the Galant makes a resounding statement about its driver by combining bold, modern, and uniquely Mitsubishi interpretations of what a midsize sedan should be. As part of Mitsubishi Motors "Best-Backed Car" program, all models are backed by a comprehensive new vehicle limited warranty that covers the vehicle from bumper-to-bumper for five-years/60,000 miles. In addition, the powertrain is covered by a 10-year/100,000 mile limited warranty, while body panels have a seven-year/100,000 mile anti-corrosion/perforation limited warranty. The "Best-Backed Car" program also includes 24-hour emergency roadside assistance with free towing to the nearest authorized Mitsubishi retailer for warranty-related repairs for five years/unlimited miles. 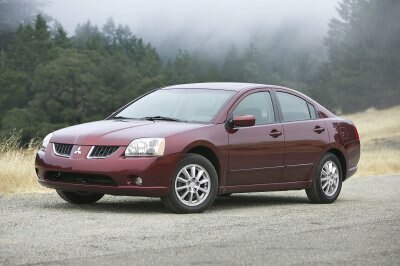 The 2005 Mitsubishi Galant is available with a choice of two powerful engines. The DE and ES trim lines come equipped with a 2.4-liter four-cylinder unit that is mated to a four-speed automatic transmission. This engine delivers 160 horsepower and 157 pound-feet of torque with the aid of its patented Mitsubishi Innovative Variable timing and lift Electronic Control (MIVEC) system. For even more performance, the LS and GTS trim lines are equipped with a high-output 3.8-liter, 24-valve SOHC V6 engine mated to a four-speed Sportronic(TM) transmission that allows the driver to select shift points. The Galant's V6 develops 230 horsepower and 250 pound-feet of torque. 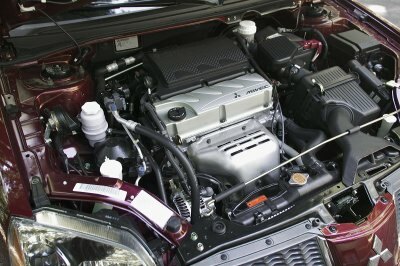 The 2.4-liter SOHC four-cylinder engine found in the Galant DE and ES trim lines utilizes advanced Mitsubishi Innovative Valve timing and lift Electronic Control (MIVEC) system technology to improve power output over a wide rpm range without compromising fuel economy or emissions in the process. The MIVEC system features separate cam profiles optimized to help deliver maximum power at high and low engine speeds, which translates to greater usable power and torque in the widest variety of driving conditions. At lower rpm, MIVEC selects the smaller cam profile, which provides stable combustion and lower emissions, and better low-speed response. But when the throttle is opened wide and engine speed increased, MIVEC allows the valves a longer duration and longer stroke, thus providing maximum and efficient power and torque over a broader range of engine speeds. The enhanced power output of the MIVEC system (160 horsepower and 157 pound-feet of torque) is achieved by its ability to vary the lift and duration of the intake valves. In the MIVEC system, there are three distinct cam profiles that create two engine modes: a low-speed mode, consisting of low- and mid-lift cam profiles; and a high-speed mode. The low- and mid-lift cams and rocker arms - which drive separate intake valves - are positioned on either side of a centrally located high-lift cam. The high-lift cam is directly connected to a T-shaped lever, which controls valve lift and duration of both intake valves in the high engine-speed mode. At lower engine speeds, the T-shaped levers connected to the high-lift cams reciprocate freely without contacting intake-valve rocker arms, thus allowing the low- and mid-lift cam lobes to control corresponding intake-valve lift and timing. The intake rocker arms contain internal pistons that are retained by springs in a lowered position at less than 3500 rpm, to avoid contacting the high-lift T-shaped levers. The benefit of the dual-profile low-speed mode is to induce swirl within the cylinder, which help create stable combustion and improve emissions. T-shaped levers are then able to directly contact the elevated rocker-arm pistons, overriding the low-speed cam lobes and fully controlling intake-valve lift and duration. The switch occurs at approximately 3500 rpm, when the powertrain control module opens the valves longer to increase the amount of intake airflow, resulting in higher engine output. More precisely, MIVEC switches to the higher cam profile at 3600 rpm as engine speed increases, and drops back to the lower cam profile at 3400 rpm as engine speed decreases; the output torque of the low- and high-speed modes overlap at those speeds. This also means the cam switch operation is virtually transparent to the driver, who is simply rewarded with more power. Under low-rev conditions the low- and mid-lift cam lobes drive the intake valves, providing better fuel economy and lower emissions. But when the throttle is opened wide and engine speed increased, MIVEC gives the valves a longer duration and higher lift, thus providing maximum and efficient power and torque over a very broad range of engine speeds. Despite its technological complexity, the basic workings of the MIVEC engine system can be expressed quite simply: MIVEC alters the cam profiles, tailoring engine performance to suit your driving needs. Intake. Several modifications were made to improve both efficiency and performance. Starting with the incoming air, the aluminum intake manifold's interior surface was smoothed to increase intake efficiency. The intake runners are also longer, and they feature a bell-mouth shape to reduce air intake resistance. Exhaust. More air coming in means more air needs to get out, so the exhaust manifold was switched from single to dual ports, which reduces interference and improves the flow of gases out of the combustion chamber. Rocker cover. For better noise reduction and to reduce weight, the rocker cover is made of aluminum instead of steel. Combustion. More efficient combustion has been achieved by increasing the compression ratio to 9.5:1 (from 9.0:1). Valves. To improve high-speed efficiency, the valve sizes were increased - intake valves are larger by 1 millimeter in diameter (to 34 mm), and exhaust valves were increased by 1.5 mm in diameter (to 30.55 mm). Pistons. With the compression height reduced, the piston height was reduced to match. Even though the pistons have a slightly larger diameter (87 mm versus 86.5 mm), they are significantly lighter in weight (278 grams per unit compared to 354 grams). For moving parts, lower mass also means better efficiency. Connecting rods. Each connecting rod was reduced from 623 g to 530 g of weight. Crankshaft. Once again engineers found a way to reduce the mass of a moving part. The crankshaft's weight was reduced from 15.8 kg to 14.9 kg. In addition, the crankshaft pulley's weight was reduced at the same time its size was increased. By using aluminum in the hub in place of steel, the pulley's weight was reduced from 2.9 kg to 1.8 kg, a savings of 1.1 kg. Timing belt. Weight and friction were reduced by shortening the width of the timing belt. To further reduce weight, the auto tensioner is now made of aluminum instead of cast iron. Serpentine drive belt. The 4G69 MIVEC engine uses a single serpentine belt to operate the engine's accessory drives for the power steering, alternator and air conditioning unit. In addition to saving space compared to the dual-belt drive system used on the previous engine, the low-maintenance serpentine belt features an auto tensioner. Cylinder Block. The height of the cylinder block was reduced to decrease weight, and the water jacket's length was shortened to help warm the engine faster for better fuel consumption. Also, air bleed holes were added to the main webs to reduce piston movement resistance, which is created by pressure pulsation when the piston is in motion. Also, the new cylinder block reroutes the oil returning from the head to reduce interference between the oil and the rotating crankshaft. The 2005 Mitsubishi Galant LS and GTS models are powered by a transversely mounted 3.8-liter, 60-degree V6 engine designed to engage drivers with a broad, responsive torque curve. The new 3.8-liter displacement is the result of an oversquare 95.0 mm bore combined with a 90.0 mm stroke to achieve its 3828 cc displacement. In the interest of durability, the 3.8-liter engine's pistons are high-pressure castings attached to forged steel connecting rods that swing from a heat-treated forged steel crankshaft. The high nickel content cast-iron, 60-degree engine block is dimensionally taller than the 3.5-liter engine's block and features revised oil passages for improved lubrication and durability. In addition, the 3.8-liter block is a new casting that has been structurally enhanced for additional cylinder-bore rigidity and includes improved chassis mounting points to reduce vibration and harshness. A pair of single-overhead-cam, four-valve-per-cylinder aluminum heads sit atop this cast-iron block; their intake and exhaust port volumes and valve diameters have been carefully designed to maintain optimal mixture velocity at low- to mid-range rpm helping to deliver the best off-the-line and highway passing response. This free-revving engine package produces a peak of 230 horsepower at 5250 rpm with peak torque of 250 pound-feet occurring at 4000 rpm. standard feature on the Galant LS and GTS-the throttle control computer receives data from wheel speed sensors to govern engine speed and regain traction when necessary. Galant is fitted with an efficient cold-air induction system that feeds ambient air to the intake manifold, which helps improve engine performance. The shape of the air inlet duct is designed to guard against the ingestion of water or snow, and draws large volumes of cool, dense, onrushing air from the grille opening. A sound-absorbing resonator attached to this intake ducting helps control intake suction noise. The Galant's intake system removes particulate from the incoming air using a low-restriction filter element that is contained in a sturdy air cleaner housing. A resonator is also used on the injection molded thermoplastic intake hose that leads from the air cleaner assembly to the engine. The Galant utilizes high-flow, welded tubular exhaust manifolds to expel the engine's spent fumes. The catalytic converter is integrated into the clamshell assembly near the cylinder heads where they can sooner achieve effective operating temperature, retain heat and promote quicker, more efficient catalyzation and increase emissions performance. The rest of the stainless steel exhaust system is designed to utilize a minimum number of hanging points, which lessens the amount of vibration transmitted to the body. A high-flow muffler minimizes backpressure while also producing a pleasant, sporty exhaust note. The Galant is equipped with a high-capacity aluminum radiator with plastic tanks that is very effective at transferring heat from the circulating coolant. This radiator uses dual electrical fans that are mounted in an airflow-efficient shroud for optimal cooling at low vehicle speeds. The radiator core size is 757 mm x 400 mm x 16 mm. The 2005 Galant is available with two different four-speed automatic transmissions. These transmissions integrate next-generation electronic controls with more refined mechanical technologies to offer superior driving satisfaction, performance, and durability. The Galant's versions of the four-speed automatics build upon years of accumulated development in design and production technologies to produce transmissions with superior structural rigidity, enhanced durability, improved efficiency and reduced weight. Both of the Galant's transmissions are equipped with the latest version of the INVECS II processor that helps the transmission match its shifting actions to both the road conditions and the operator's driving style and inputs. INVECS II provides drivers with what they perceive to be the optimum shift points. It also includes a "learned control" function whereby the computer measures the timing of the driver's accelerator inputs and tailors shift action accordingly for softer or firmer shifts. In addition, the version of the four-speed transmission mated to the V6 is equipped with a Sportronic(TM) mode that offers dynamic manual shifting by simply moving the shift lever into the sports mode gate for more fun-to-drive control. The Galant's chassis utilizes a nimble four-wheel independent suspension attached to a pair of flex-resistant reinforced steel front and rear subframe members that are joined by supports spanning the length of the floorpan. This all-steel structure features multiple reinforcement locations with strategically placed support members that help develop a stiff, safe unibody. Built using modern construction and adopting MASH seam welding techniques to help increase structural rigidity without incurring major weight penalties, this vehicle's unibody achieves a high level of strength and rigidity. Mitsubishi's own evaluations have confirmed that the Galant meets or exceeds the federally mandated performance criteria in the 30-mph frontal, 30-mph oblique and the 35-mph rear collision tests. The 2005 Mitsubishi Galant's four-wheel independent suspension design endows it with refined driving characteristics more atypical of luxury sedans than a midsize segment contender. A wide track (61.8 inches, front and rear) and long wheelbase (108.3 inches) help the Galant provide a comfortable, stable ride, regardless of pavement conditions. The Galant's rigid unibody chassis and four-wheel-independent suspension are engineered to deliver equal parts performance and comfort. arms. These control arms are supported by a rigid crossmember that spans the distance between the control arm mounting points, controlling lateral movement of the control arms and helping to maintain a more consistent suspension geometry resulting in better, more predictable handling. The large, low-profile crossmember was designed without a "kick-up" in its main section and increases rigidity at the suspension mounting points while helping to reduce component weight. The design of this flat suspension crossmember also facilitates an optimized, lower steering box mounting location that helps realize more linear toe changes and improves the vehicle's straight-line handling on uneven surfaces. The lower control arms swing from the chassis using dual-density rubber bushings made of more compliant material in the top half of the bushing shell to reduce the harshness of road input. A harder rubber material maintains the shape of the lower half of the bushing shell to help improve cornering performance. The movement of the long control arms was engineered to help generate ample wheel stroke to Galant's suspension track surfaces. This design enables more effective and predictable toe and camber changes across its range of movement for superior traction and control on uneven surfaces. All Galant models are equipped with a front stabilizer bar that is attached to the struts using ball joints; the bar's friction surfaces are Teflon(TM) coated on GTS, which helps the stabilizer respond quickly to suspension changes with smoother movement. In addition, the Galant's hub unit is designed to use angular contact wheel bearings that help lower friction and improve ride while also reducing noise and drag. compact suspension design helps the Galant achieve excellent ride quality and handling stability while offering a low cargo floor in the trunk. The low-profile positioning of the entire rear suspension - with its strategic location of coil springs, shock absorbers and links, and reduced mounting point height - helps to enhance the utility of the trunk space. At the Galant's rear, a pair of gas-charged shocks and coil springs absorb and help negotiate the road's imperfections as long, lower control arms track over the road. Strong rear trailing arms mounted with large, vibration-absorbing rear bushings and rigid upper suspension links help provide increased stability. The reduced height of the insulation system used atop the shock and coil spring has also helped reduce the suspension's intrusion into the trunk area. A large lattice structure made of steel helps increase suspension rigidity - especially at the control link mounting points - and provides a dramatic reduction in the ability of vibration and road noise to penetrate the passenger cabin. In an effort to provide superior handling, Galant's suspension designers made the rear suspension control arms as long as possible to maximize the movement of the independent suspension and allow for optimal toe and camber changes over uneven surfaces. Large-diameter rubber suspension bushings located at the friction points of the lower control arms and upper links also help reduce the vibration and road noise that are transmitted by the suspension's steel links and control arms. In addition, an eccentric cam in the lower rear control arm mounting points can allow for the slight tuning of toe and camber. As with the front suspension, the Galant rear suspension incorporates stabilizer bars that attach to the rear lower control arm and uses ball joints for improved, less-restricted movement. In addition, the suspension bump stopper is made of a more resilient urethane material to offer superior shock absorption properties and to prevent the suspension from exceeding its travel. The 2005 Mitsubishi Galant relies on a hydraulic rack-and-pinion power steering system to help deliver a sense of direct, responsive steering feel and control that drivers expect from a passenger car. The low positioning of the steering assembly on the front crossmember helps improve steering feel and response with a more linear path for the control links to the knuckle arms and front hubs. The power steering gearbox is attached to the crossmember using rubber bushings engineered with multi-directional hardness that offer support for front to rear movement and increased compliance for lateral movement. The Galant's speed-sensitive hydraulic power steering pump reduces its fluid flow at higher speeds to increase the steering effort at highway speeds. This system maximizes power multiplication in slow-speed situations such as parking, and helps provide a safer, more enjoyable driving experience. All Galants are equipped with a vacuum-assisted four-wheel-disc braking system that includes vented front discs and solid rear discs. The front rotors measure 10.9 inches in diameter (11.6 inches for V6-equipped LS and GTS trim lines) and the solid rear discs measure 10.3 inches in diameter. The Galant utilizes a powerful single-piston caliper design up front with dual 60 mm pistons and a single 35 mm caliper piston at the rear. Anti-lock braking with Electronic Brakeforce Distribution (EBD) is standard equipment on every V6 Galant, though ABS is also offered as optional equipment on the Galant ES. tires. The sportier GTS trim level features five-spoke, 17-inch aluminum alloy wheels and 215/55R17 tires that help provide the Galant with undeniable curb appeal. The sporty cast aluminum wheels add a sense of athleticism to this midsize sedan. The optional Diamond Package on the ES and LS offers a sporty ten-spoke design. The Galant is equipped with advanced driver and front-seat passenger front air bags in order to help optimize occupant safety. For 2005, front seat-mounted side impact airbags are standard equipment on all Galants. Front seatbelts are equipped with pre-tensioners and force limiters that help to maximize the performance of the front safety belts in severe frontal collisions. The Galant's steering column shaft is secured by a fall-away bracket and a slide plate mounting system that allows the column to better absorb impact energy in the event of a collision. Mitsubishi Motors North America, Inc., (MMNA) is responsible for all manufacturing, finance, sales, marketing, research and development operations of Mitsubishi Motors Corporation in the United States and Canada. Mitsubishi Motors sells coupes, convertibles, sedans and sport utility vehicles through a network of approximately 650 dealers. For more information, contact the Mitsubishi Motors News Bureau at (888) 560-6672 or visit media.mitsubishicars.com.